FNEW types Single half fNEW � zig zag, - Double- parallel, fNEW out, gate and cross fNEW. Other features Skew correcting device/ removable fNEW rollers for easy cleaning/ optional perforating device. The Superfax PF220 A3 folding Machine is designed for high volume users requiring accurate folding position set up at the push of a button. The 220��s electronic memory stores 36 folding configurations for various paper sizes to enable users to choose from the following popular fNEWs. In addition to the preset fNEW options, the PF220 can be set to produce custom fNEWs by entering in the fNEW measurements in millimetres with the Digital L.E.D Display. All folding Machines periodically need their FNEW Rollers cleaned. The PF220 has removable fNEW rollers to make cleaning an easy operator task. Without this user friendly feature- you would be faced with calling out an engineer or, as with some of our competitors- packing the machine up for a return to base repair- either way you would be out of action for some time and incur additional costs . 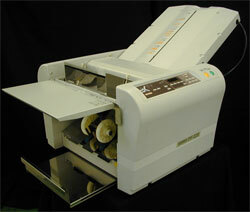 Supplied as standard, the guides enable users to re-feed fNEWed documents through the machine for a second fNEW. A typical application would be to fNEW A3 in half and then re-feed the documents back through the machine to fNEW down to DL envelope size.